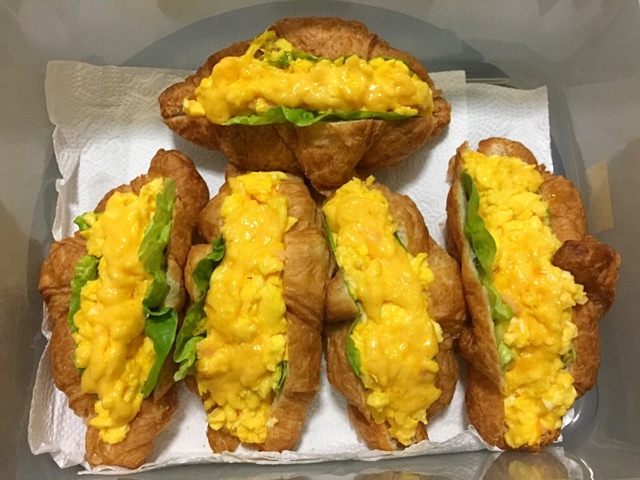 How to prepare Scrambled Eggs Croissant with Cheesy Butter Sauce? I aggravated my wisdom tooth wound all because I wanted to eat a piece of roasted pork belly. No choice, I am back to eating soft food. 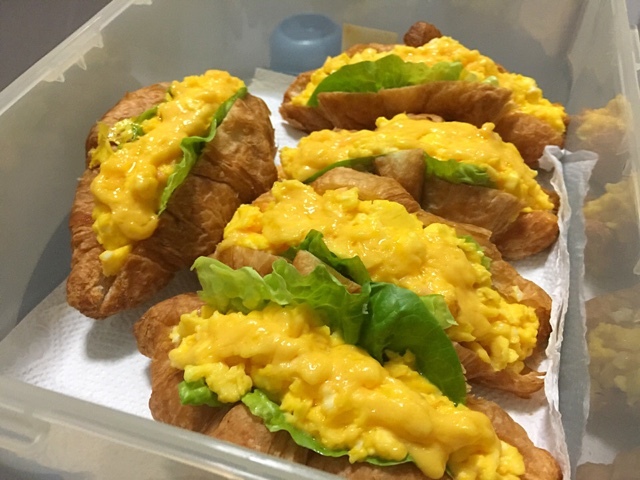 I decided to cook scrambled eggs for myself so I thought why not prepare some scrambled eggs croissants for my colleagues? 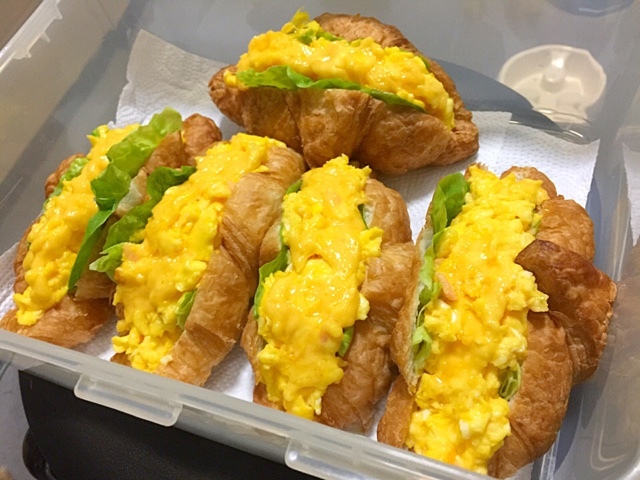 I got the idea of having scrambled eggs in croissant from Lola's cafe which uses Cajun Mayo as the sauce. I got the idea of butter cheesy sauce from The Seasonal Salad baked potato with butter and cheese. It was divine. Creamy scrambled eggs have to be prepared over very low heat. To prepare the eggs, I cracked the eggs into a bowl and added a small amount of pasteurised fresh milk. In order not to have bits of egg shells in your beaten eggs mixture, I learnt from Masterchef that all you need to do is to knock the egg against a hard surface before cracking the egg into the bowl. It really works! Try it! I added some oil and a small amount of butter on my Tefal frying pan. I like the Tefal frying pan because it has a red dot in the middle to tell me when the pan would be heated. I turned the stove to low heat and poured in the beaten eggs. I scrambled the eggs, making circular motions. The eggs would start to cook after 1 minute or so. I also sprinkled some salt over the eggs. For this batch of croissants, I stir-fried and added small pieces of smoked salmon to give it some flavour. 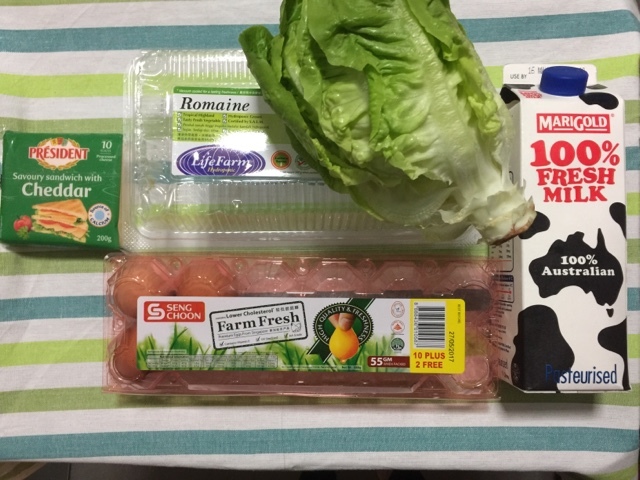 I stuffed the croissants with Romaine lettuce and scrambled eggs. Next, I melted some butter and cheese by heating them in the frying pan. Once the butter and cheese have melted into a thick sauce, I spread the sauce over the scrambled eggs. I ran out of black pepper. It would look and taste even better with black pepper. Packed and ready to deliver! I realised that the butter croissants have to be toasted just before serving in order to be crispy and buttery. It was great that there was a toaster oven in the pantry. My colleagues are a very supportive bunch and commented that the croissants were delicious and awesome. One of them added that she liked the combination of cheesy sauce with the eggs and the sweetness of the croissants.